Esteemed by racers and race series’ around the world, NTR Race R1 kits provide the answer to uncompromising quality, reliability and performance without the need for a remote canister. Fade-resistant and hand built with ultra-low friction components, the Race R1 shock is made to last on the track and road. The high-grade materials protect against corrosion whilst significantly reducing weight. Every R1 kit is custom built, sprung and fully serviceable. A double-acting single dial delivers effortless control over wide-ranging damping adjustments; allowing the vehicle to rapidly react and adapt to changing circuit conditions. 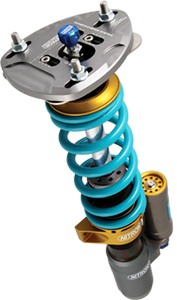 NTR Race R3 kits set the standard for ultimate performance. The design, responsible for the VLN Nurburgring lap record, offers racers and engineers unparalleled damping control. Achieving success in some of the most challenging endurance races around the world, Race R3 kits are reliable and virtually eliminate fade. Through use of a class-leading 46mm piston design and ultra-strong piston rod, Race R3 shocks demonstrate exceptional levels of damping control and refinement. Remote Control A piggyback or remote reservoir allows for tool-free, quick, simple and independent control of compression and rebound damping. Widely praised by journalists and revered in paddocks across Europe, North America and Japan. Bi-Axis Hose Fittings NTR Hose shocks are fitted with Nitron’s exclusively developed Bi-Axis fittings that allow for simple and precise installation. Titanium Finish Titanium and hard-anodised parts are hand built to last not only the lengthiest endurance races but also the harshest of winters. Data Logging Race R3 shocks are available with incorporated data-logging potentiometer mounts.